Sixty Mumbaikars watch with rapt attention as Preeti Patil stands before them and carves an apple, a stand-in for planet earth. By the time she is done, there is barely a sliver of an apple left, which she holds up. “That’s all the land we’ve got, to grow food.” A shocked murmur punctuated by a few nervous giggles runs through the heterogeneous crowd of listeners. There are all sorts here, seated in the conference hall inside Maharashtra Nature Park’s education centre—IT professionals, lawyers, doctors, students, the silver-haired, the middle-aged and the pimply adolescents. To them, Preeti is a bit of a celebrity. They have all read about how she, as the catering officer of Mumbai’s Port Trust, galvanised her department workers into turning the 3,000 sq ft terrace adjoining the canteen into a lush ‘forest’. 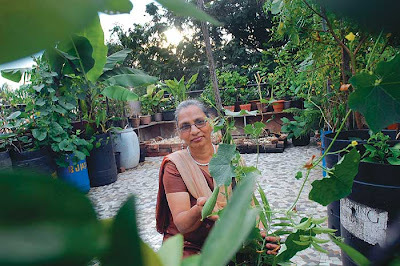 They are amazed at the fact that her edible garden recycles 20 kg of waste generated by the canteen’s kitchen everyday. They have seen pictures of her garden’s abundant yield on the net. There’s tulsi, mint, startlingly tasty veggies like spinach, okra, brinjal and cherry tomatoes that are often plucked and eaten raw by Port Trust workers—and, of course, fruits like guava, custard apples, mangoes, bananas and even coconuts, harvested from a gigantic palm that rests on the terrace wall. And so here they are, forsaking holiday laziness on a Sunday morning, to learn how to become urban farmers. Urban farm. The two words seem contradictory. What do the bucolic images we have of lush, fertile farms have to do with the unrelenting grey of urbanisation? Plenty, it seems. World over, urban farms have come to the rescue of city-dwellers in times of crisis. Right after world wars, victory gardens sprouted in the UK, US, Canada and Germany, mostly in urban areas, to bolster food security. As Preeti and others in the urban farming movement say, we in India are on the edge of a crisis too. As our cities grow and expand to meet the needs of their booming populations, we are encroaching on the peri-urban land that meets much of the food needs of our cities. So, in the future, food will travel even longer distances to reach us, increasing our carbon footprint. We will also have to shell out more for our veggies and fruits, as demand increases. And thanks to our dependence on chemical agriculture, we already eat food laced with pesticides and fertilisers and critically low on nutrients. Driven by these issues, Preeti started the NGO Urban Leaves in November 2009 to promote natueco farming—an organic method that uses easily available biowaste to create a nutrient-rich but light-weight soil mixture they call amrut mitti. In less than a year, attendance at her workshops has doubled from the initial 30, and there is a waiting list for the next one. It is a motley crowd, from Ubai Hussein, a chef-turned-organic farmer, dismayed at the quality of vegetables available in the city’s markets, to airport worker Mavis D’Souza, who once accidentally grew miniature watermelons on her terrace and got hooked. She tracked down Preeti with the tenacity of a bloodhound over the internet and signed up for a workshop. She now lords over her little kitchen garden in Borivili, a Mumbai suburb, feeding friends and neighbours fresh strawberries and lady’s fingers, and gushes about how “even a karela tastes sweet when grown and served with love”. Meanwhile, another urban farming guru, Deepak Heilekar of Marathi Vigyan Parishad, sees a swelling crowd at his own workshops. “I use these workshops to bust common fallacies about terrace farming, that it causes seepage, or that cracks develop because of the weight of the plants,” he explains. Heilekar educates attendees about farming techniques and the need to use lightweight containers for plants, like recycled plastic drums, gunny bags and crates. “While you might have to put in some effort to source biowaste and used drums, the actual cost of setting up your organic terrace farm is minimal. All you’ll probably spend on are the seeds,” he explains. The mechanics of urban farming apart, the philosophy behind it, of abiding by natural cycles and realising the oneness of things, is drawing professionals from India’s Silicon Valley to urban farming workshops too. When Dr. B.N. Vishwanath, one of the pioneers of organic terrace farming in Bangalore, began holding workshops way back in 1996, the crowd, he recalls, consisted of mostly housewives and retired people. “But since 2008,” he says, “I have seen a sudden spurt in the number of young professionals attending them, mostly from the IT sector.” And why not, he asks. “It cools your house down, gives you oxygen, recycles your waste, and gives you chemical-free vegetables all the year round if you plan properly,” he says. Enough to feed a family? Apparently, yes, according to Vishwanath, who says that six vegetable varieties grown in a 600 sq ft garden can give you 10 kg of fresh veggies every week! 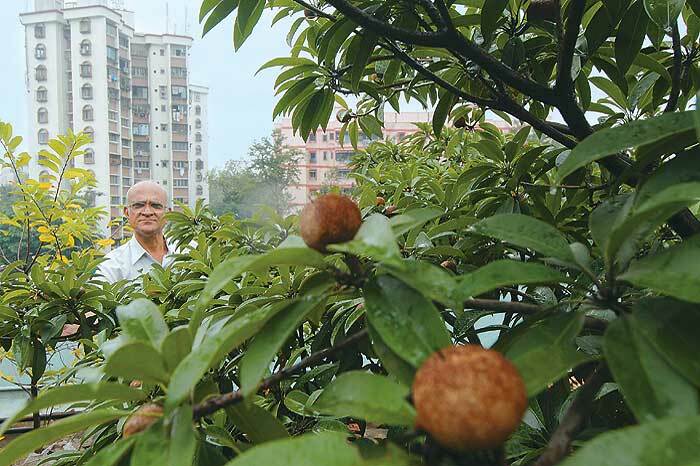 His claim is backed by Dr. M. Prabhakar of the Indian Institute of Horticultural Research, Bangalore, whose department’s experiments have shown that a terrace measuring 1,200 sq ft can easily feed a family of five. That’s quite a reward for about an hour of work everyday, though it does take four months, plus patience, to develop the perfect soil mixture. Vishwanath realised that to aid the spread of urban farming, it was important to create a sense of community. And so, he took it on himself to organise the first national seminar on organic terrace gardening. Held last month, it allowed urban farmers, horticulture experts, entrepreneurs and scientists from Chennai, Hyderabad, Mumbai, Chandigarh, Delhi and Bangalore to exchange contacts, strengthen existing e-groups and discuss farming techniques. For A.M. Malati, who runs her own detective agency in Chennai, as well as an organic farm and a bee farm to boot, it was a heaven-sent opportunity to share her expertise and meet other enthusiasts. Like Moonstar Kaur, for example. Hailing from Chandigarh, this Indie-filmmaker has been growing veggies at her joint-family homestead and also on a plot of land her family owns in the middle of the city. “I think I am the only city farmer in Chandigarh,” she says ruefully. But in nearby Ludhiana, she discovered fellow urban farming buffs, Dinesh and Meenakshi, who grew veggies in broken neon signs and wooden crates. Another seminar participant, Jumana Parkar, has quit her lucrative job as a flight attendant and is volunteering in farms across the country to learn farming techniques. And then there is Vijay Padma, an architect from Hyderabad, who is persuading her clients to set up urban farms on the buildings she designs. As the movement gathers force, some urban farmers are also getting entrepreneurial. Ubai Hussein, the chef-turned-farmer, has started the Hari Bhari Tokri scheme where signees will receive a weekly basket of his organic veggies, at Rs 100-200, depending on size. Six hundred people signed up within a fortnight of his offer. In Bangalore, Vinay Chandra helps people set up their terrace farms, for Rs 1,000-6,000, plus the cost of materials. He has got 10 farms started in recent months. 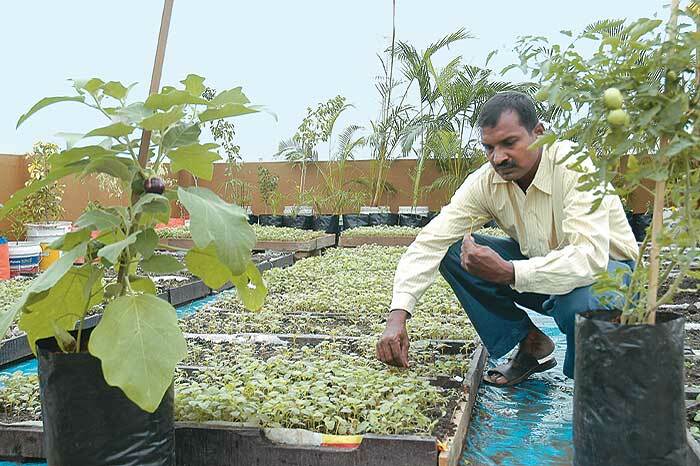 Dr D. Padmanabhan of Chennai has gone a step further—he wants people to profit from their terrace farms. “You can get an income of up to Rs 4 per sq ft per month. So I help set up commercial farms for people who have a terrace area of 2,000 sq ft or more.” With people like these around, the idea of sustainable cities seems less and less of a pipedream. Maybe, just maybe, in 2050, when you stand on the tower of a skyscraper, there will be no greys—only greens.